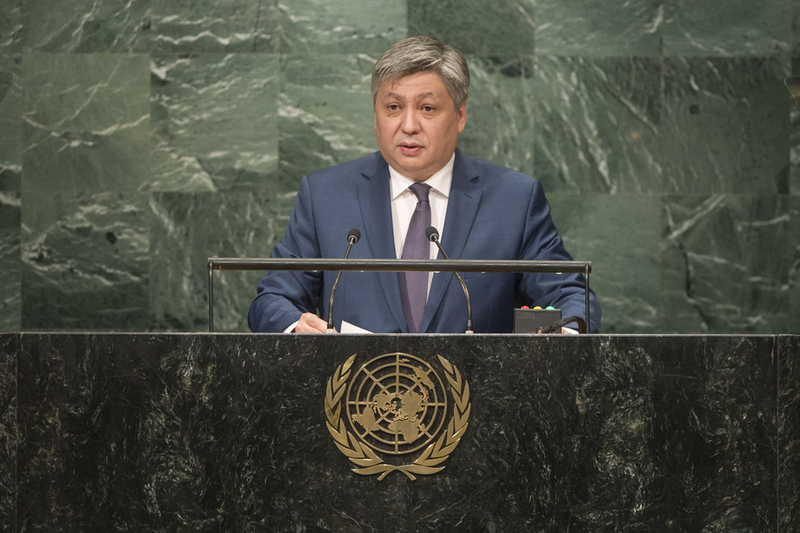 ERLAN ABDYLDAYEV, Minister for Foreign Affairs of Kyrgyzstan, celebrated the conclusion of his country’s October 2015 parliamentary elections, and thanked the Secretary-General for his support during that process. He called upon the United Nations and partner organizations to support the country’s upcoming elections in 2017. He expressed his support for the Sustainable Development Goals, which included a number of priorities for his country, including poverty reduction, high-quality education, health care, economic growth and environmental protection. On that note, he announced that he had signed the Paris Agreement outside the General Assembly hall the preceding day. Enumerating the many environmental stresses Kyrgyzstan faced, he called for international support to help his country adapt to climate change. Particularly concerning was the rapid rate of glacial melting, shrinking biodiversity and uranium mining sites, which despite having been addressed under General Assembly resolution 68/218, now required a high-level international meeting. Turning to issues of security and stability, he expressed concern about tensions in Afghanistan, the Middle East and Ukraine, and noted that terrorism, extremism and religious intolerance afflicted his country like so many others. Observing that the “confrontational position of some countries” was hindering the international community’s ability to tackle those threats, he called for world Powers to set aside their disputes and undertake joint efforts to counter threats to international security. There needed to be a General Assembly resolution on inter-religious dialogue and cooperation for peace. Concerned about his country’s electricity shortage, he called for Central Asia to reach a common understanding on the rational use of energy resources and an expeditious resolution of border disputes. He added his voice to others calling for Security Council reform, and welcomed recent procedural changes in the election of the Secretary-General. Finally, he expressed his concern about the involvement of the Office for Democratic Institutions and Human Rights in the case of Azimjan Askarov, who had been convicted by the Kyrgyz Supreme Court. Such interventions were liable to destabilize his country.